Short-term interest rates in Europe are rising, in anticipation of a decision by the ECB to start raising interest rates. ECB President Trichet today surprised the world by suggesting the ECB may raise rates at its next meeting, in response to evidence of rising inflation pressures. German 2-yr yields, priced to the market's expectation for the average of the ECB's target policy rate over the next two years, jumped over 20 bps today and have risen almost 100 bps so far this year; they are now 100 bps above 2-yr Treasury yields. 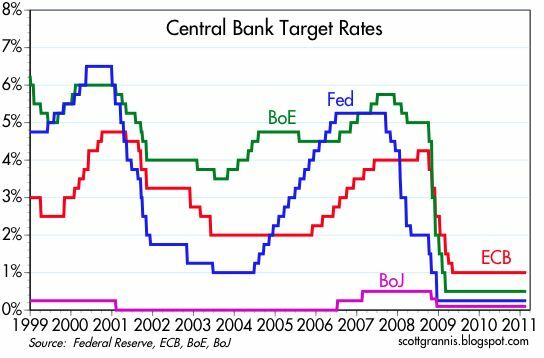 As the chart below shows, the ECB already has the distinction of being the "tightest" major central bank in the world, with its target rate of 1%. (It would be perhaps better to say that the ECB is the "least easy" of the major central banks.) If they are the first to tighten, and it would appear likely, this will be a very important development. The world's major central banks—with the notable exception of the Bank of Japan—tend to move together, as the chart above suggests. An early move by the ECB to raise rates will thus put pressure on the Fed to follow suit. Is this something to worry about? No. The prospect of higher rates has not deterred European stocks from rising, and it has given a substantial boost to the Euro, as indeed it should. Currency markets love tight-fisted central banks. The dollar, in contrast, is at its weakest level ever, thanks in large part to the Fed's repeated promises to keep rates close to zero for a very long time. European yield curves are still very steep, and the real ECB target rate is approximately zero. This means that the ECB could (and is likely to) raise rates by hundreds of basis points over the next several years before policy becomes tight enough to threaten growth. In the meantime, it bolsters confidence in the Euro, and strengthens the outlook for the Eurozone economies. I note also that 2-yr Euro swap spreads fell today on the ECB news, and are now at a 10-month low—another sign that this is a welcome development. Do you think the troubles in the Middle East are covering up another "Euro" crisis? 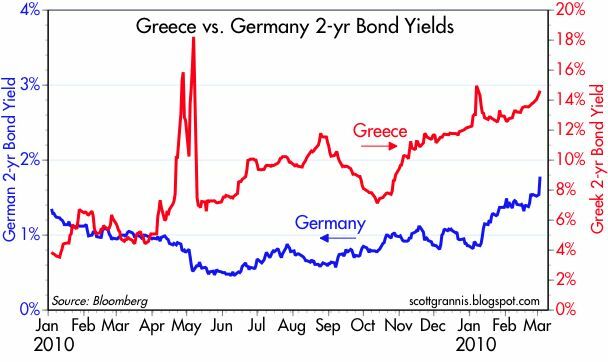 Some of your favorite bloggers are citing increasing spreads between German, Spanish and Greek bonds. Not sure I follow you. Greek spreads are widening, but Spanish spreads are narrowing. German yields are rising because the market is pricing in rate hikes from the ECB. Greece may well default/restructure before this is all over, but that doesn't amount to a crisis. Hi Scott, what do you think if the ipad 2? havent seen any Apple posts in a while :( I cant wait to finally get one!!! I think it is terrific, and I will be getting a new iPad 2 as soon as I can. I am pondering whether QE is more important than interest rates, given the worldwide glut of savings. When people save too much, it sinks interest rates and demand concurrently. You reach zero bound, yet demand is weak--what to do? I don't like fiscal responses--by deduction, that leaves QE. QE may have to become a tool in our arsenal that we go back to again and again. The modern economy may not work the way classical economists say it should. The savings rate is one area--the economy weakens people start saving more, or they may save regardless of interest rates due to retirement concerns, college needs, health care concerns etc. Ironically, the less social welfare net you have, the bigger the urge to save in liquid investment that are not erratic in value. Read government bonds. The more need for QE. Without QE, when you hit zero bound, the economy sputters. Ala Japan. It can sputter for decades and decades. The more important question should be, will the ECB do QE? It think it should. And the most important goal is to avoid Japanitis. And oil is going to make its presence felt in due course. I just filled my tank at $4/gal. Reminds me of circa 2007/08. We consume more oil regardless of how efficient we've become. $4/gal and rising will smack the US wallet right where it counts. Add rising food costs and it won't matter if your new iPad was discounted $100. We need to eat and commute to survive, not buy cheap threads and electronics.